If you have a website, mailing list, retail shop or other customer base that is sports and fitness related then we would love to hear from you. We are looking for resellers of Hornet Juice, our scientific sports drink with 17 amino acids that works by metabolizing body fat for energy, greatly increasing athletic performance. Innovative product that produces amazing results. No direct competitors in the sports nutrition market. Hornet Juice is not just another “carbohydrate replacement” but a scientific formula that acts as a trigger for the oxidation of fat to provide a long-lasting source of energy. Because Hornet Juice is not a replacement for existing sports nutrition, but a complement, it will not replace sales of other sports nutrtion products. Wide market appeal. Anyone participating in any sport or general fitness activity can be considered a potential customer. Hornet Juice is not just for marathon runners and Ironman triathletes. Increased athletic performance means repeat business and credible referral marketing. Reliable and flexible supplier that can work with you to build your business. Prompt and friendly technical and customer support. Excellent customer satisfaction and product demand with insignificant customer returns. We invite you to join the Hornet Juice Drop Ship Program, which means you take the orders and receive payment from your customers and have us send the goods out on your behalf direct to your customer. Make a profit from helping your customers boost their athletic endurance by introducing them to the performance enhancing benefits of Hornet Juice….they will thank you for it. Our Drop Ship Program is free to join and we take care of everything. Remember, this is a low risk proposition as we offer a money back guarantee and free worldwide shipping. No need for you to carry any inventory. There is no minimum quantity that you need to order….we can ship single items. You don’t need to ship anything as we do it all for you….right to your customer’s door. We offer a factory direct wholesale price allowing a healthy margin for you. We’re happy to provide any sales or customer support that you require. Money-back guarantee to ensure complete customer satisfaction. To join the Hornet Juice Drop Ship Program click here to complete the application form. If accepted into the program you will be contacted shortly with a personal access code, which you will use each time you place a drop ship order with us. As part of the Hornet Juice Drop Ship Program you will receive a wholesale price of $1.45 per serve, which gives you a 36% discount off our recommended retail price ($2.25), providing you with the opportunity to make a healthy margin. Also, we offer you free shipping. To place a drop-ship order simply use your personal access code and enter your credit card or PayPal account details (you will deal direct with your customer to collect payment from them) and the shipping address of your customer. We take care of the rest and immediately send the Hornet Juice direct to your customer. A confirmation email will be sent to you only, leaving you to deal direct with your customer. Your credit card or PayPal account will be charged with the Hornet Juice drop ship price, which represents a substantial discount off the retail selling price. Remember that we offer free worldwide shipping and a money-back guarantee. We undertake to have no correspondence direct with your customer, allowing you to nurture this relationship. 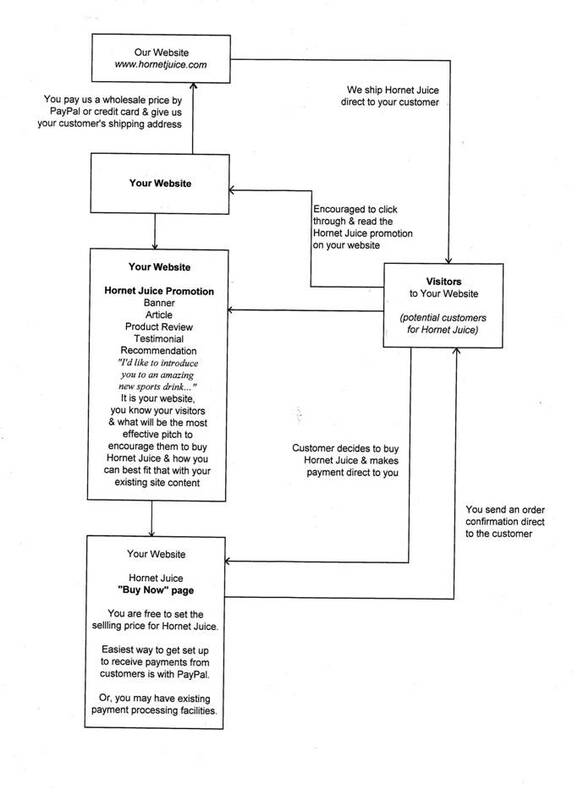 Below is a diagram of how the drop ship program works.